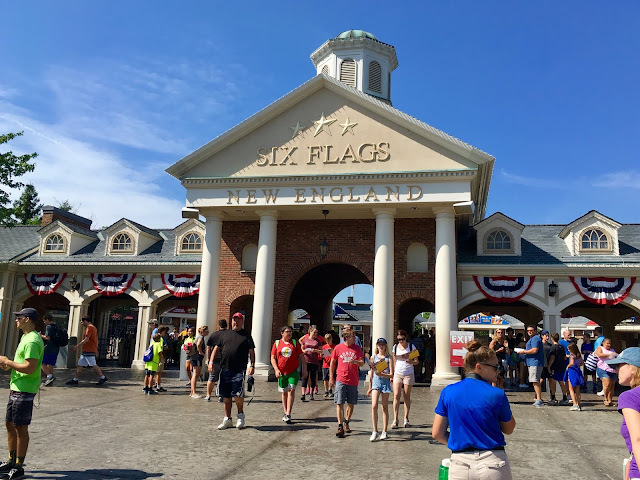 Today we head up north to check out Six Flags New England! 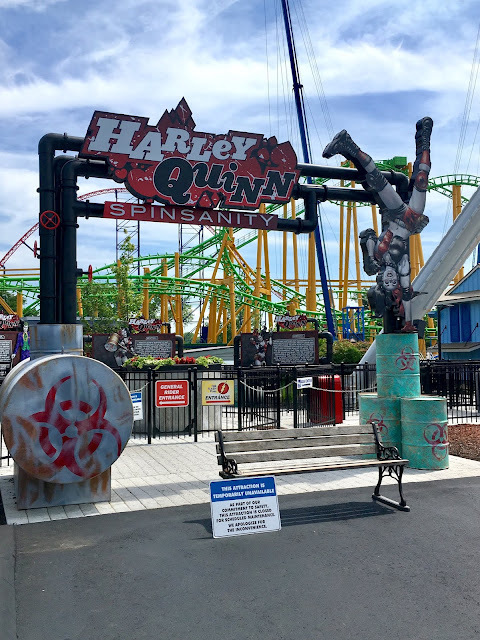 We take a look at the new for 2018 Harley Quinn Spinsanity, Gotham City retheme, new trains on The Riddler's Revenge, and much more! 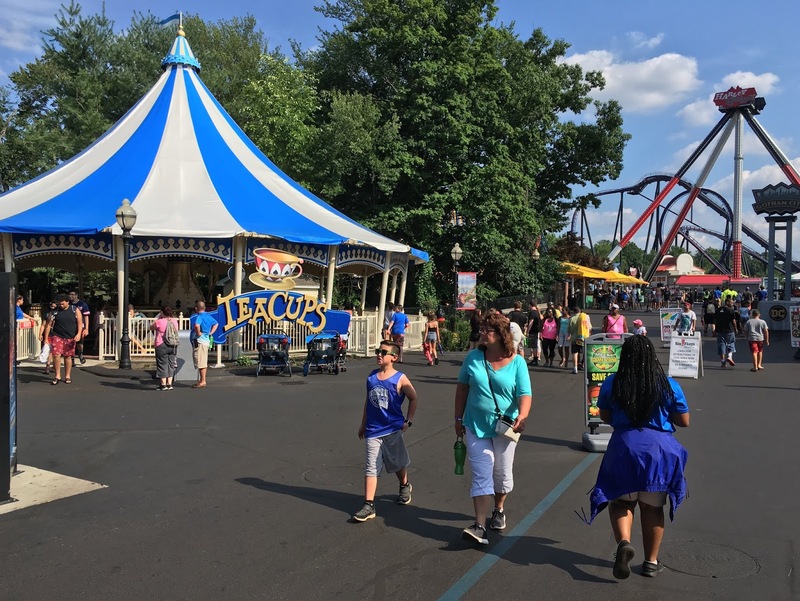 Today's forecast was sunny skies, and the park was subsequently busy for a week day. 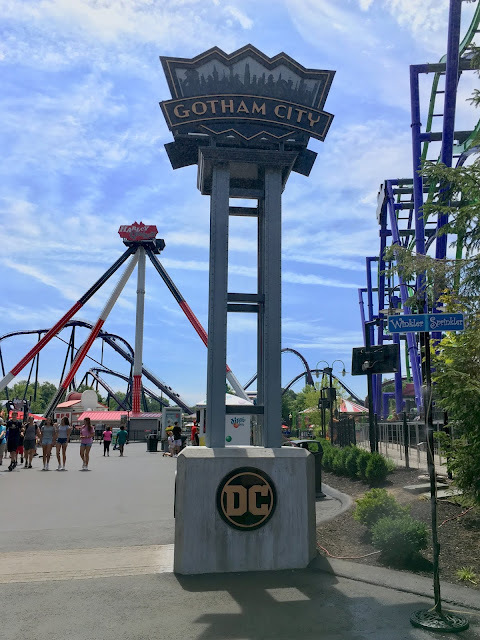 First up, the park's South End section has officially been rethemed to Gotham City! 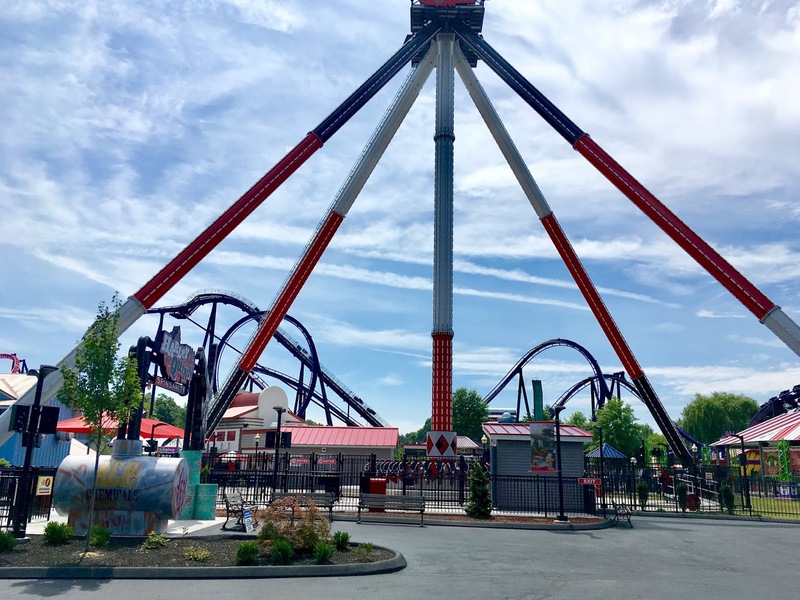 The park likely made this move due to the arrival of Harley Quinn Spinsanity for 2018, which puts a high concentration of DC rides in this area. Unfortunately, the ride has been closed all week. The sign is likely incorrect when it mentions "Scheduled Maintenance", as this attraction is brand new. 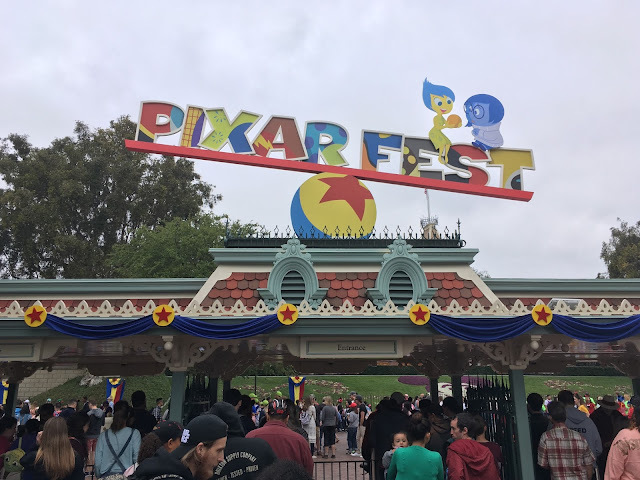 An employee told me that the park had run the attraction in heavy rain for a few consecutive days, and some type of sensor was consequently fried in the process. 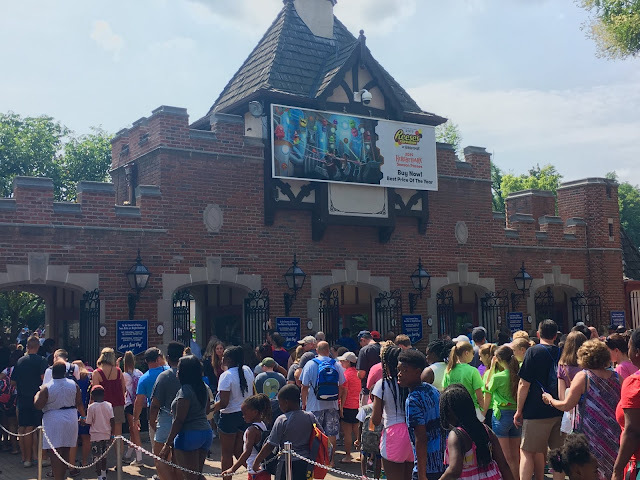 I did not see any work being done on the attraction throughout the day, so it is probable that management is waiting for a part to be shipped from the manufacturer. The placement of Harley Quinn relocated the Tea Cups attraction, which now sits just outside Gotham City's boarder in the former Buzzsaw attraction location. 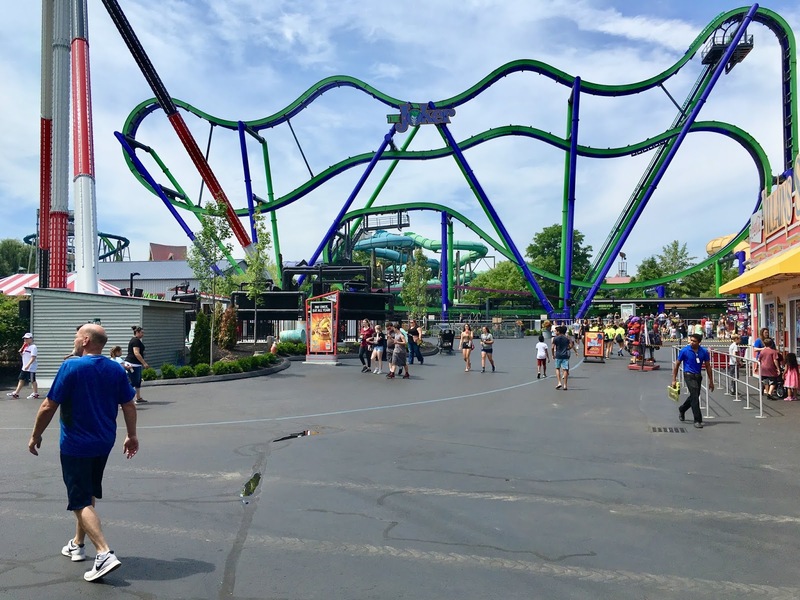 Buzzsaw has consequently been permanently removed from the park. 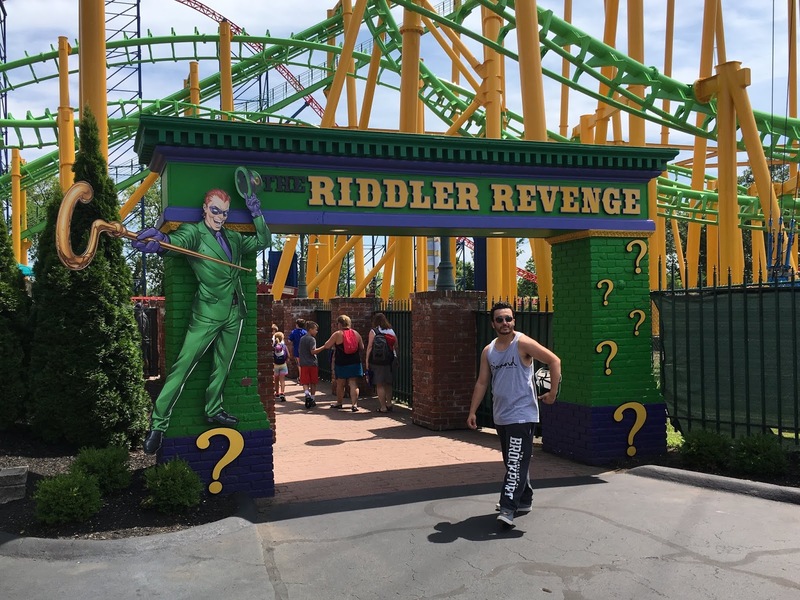 Back to Gotham, Mind Eraser has also been rethemed to The Riddler's Revenge to match its surroundings! The newly rethemed entrance archway looks nice and bright with its paint job! 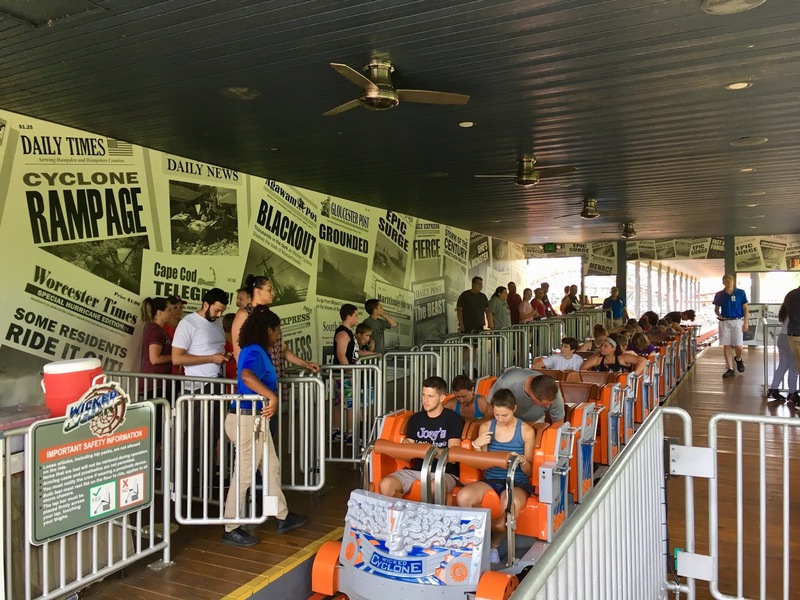 Even better, the park upgraded the ride with new soft restraint trains from Vekoma. The restraints are comfortable yet firm, and have a bucket-style chair that securely drops you down into your seat. I generally do not ride this type of coasters (Vekoma SLC) because of their extreme roughness, but I decided to give it a shot with these new trains. While the coaster is still rough and jittery, the trains have improved the experience. The new restraints eliminated the headbanging issue....as there is literally no physical part of the train to bang your head on! But do be warned: your head will still be snapped right and left while you ride due to the roughness! A little ways down the road, the Gotham City Crime Wave is also experiencing a little mechanical issue. 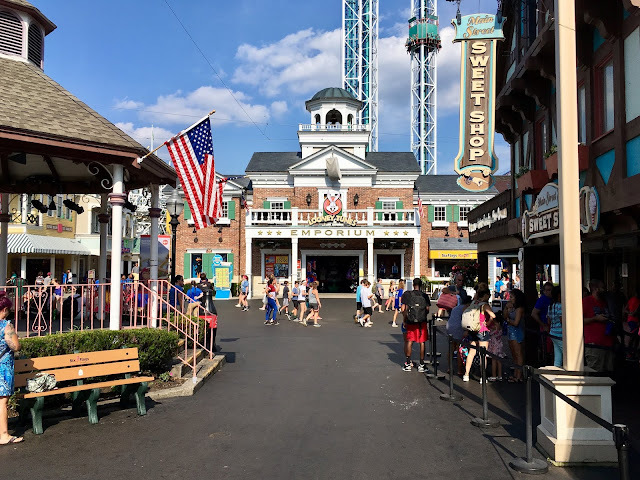 Word on the street is the main pneumatic pump that lifts the swings up failed, and the ride had to be completely disassembled to replace the part. Hopefully the pieces will be put back together soon! Overall, the Gotham City theming elements are minimal. With the exception of the Riddler retheme and the renaming of existing snack shops, not much else has been done. 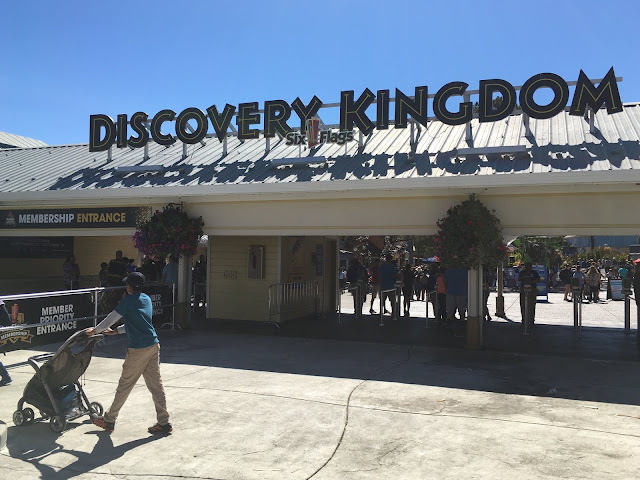 Hopefully some additional thematic elements are added to this section over time to really sell the environment, as the park already does a great job of theming other areas of the property. 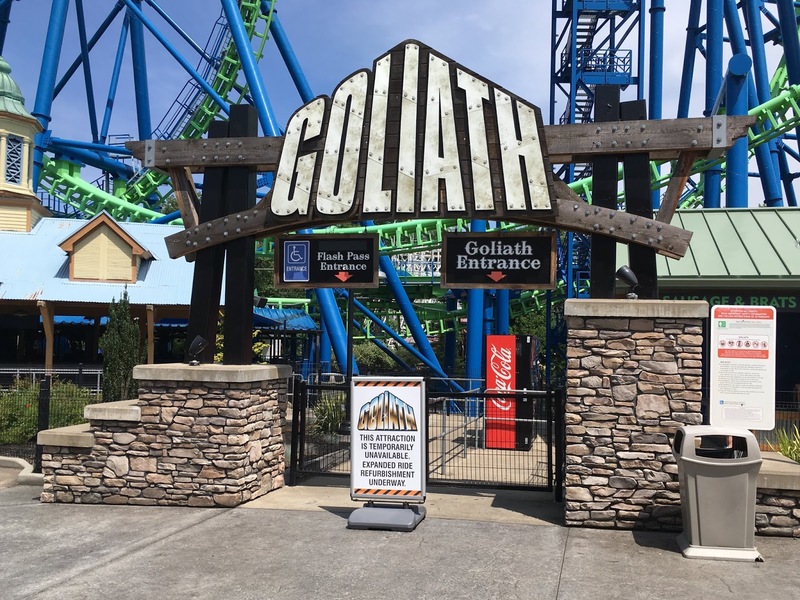 Moving on, Goliath is also down for "Expanded Ride Refurbishment" during the main Summer season....interesting. 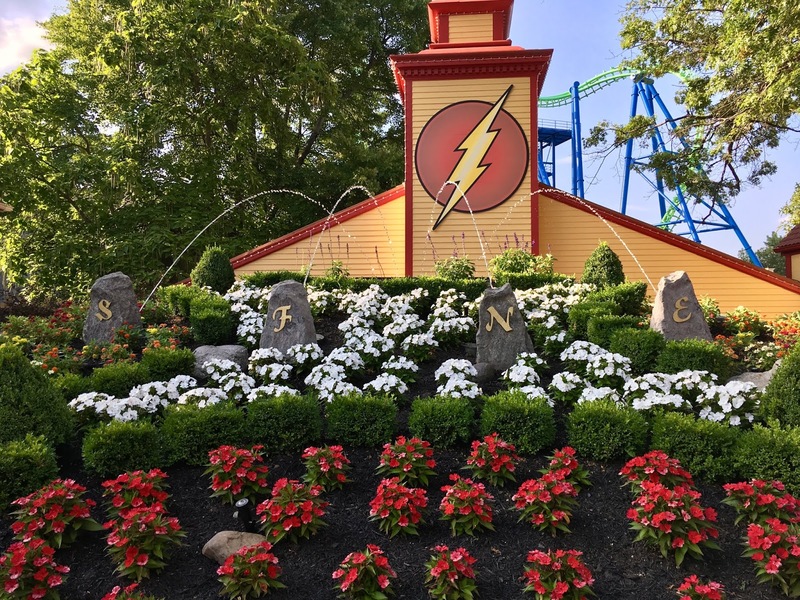 It seems that SFNE is having the same downtime issues that Magic Mountain had when this coaster was still located in their park. Hopefully things are fixed soon. 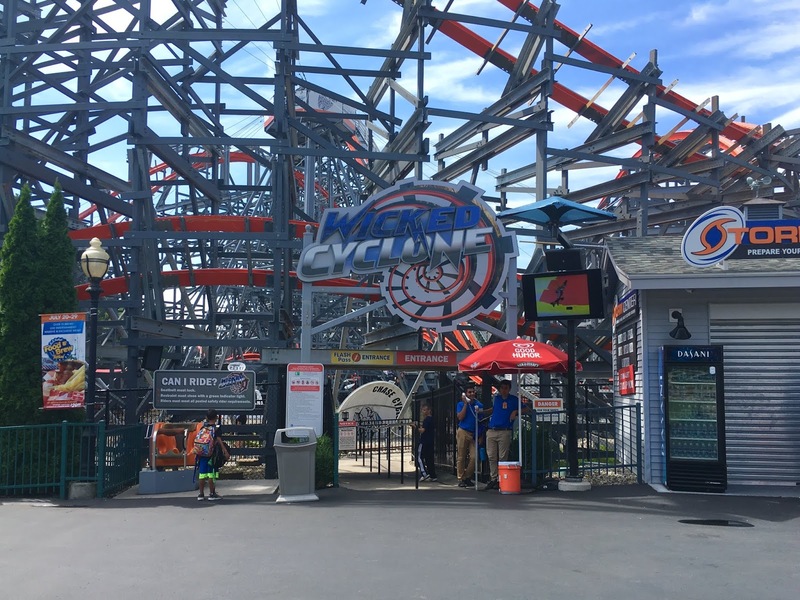 Finally, Wicked Cyclone was running virtually wait-free all day (Even when Superman's queue was 45+ minutes)! This RMC coaster is easily the best-themed out of them all. Even though RMC has debuted some meaner and leaner machines since Wicked Cyclone (see Steel Vengeance), this ride still holds its own. The pacing is nice, and the unique low-to-the-ground elements (with the seemingly never-ending final inversion) are unique in themselves! Thanks for the great day New England...until next time!